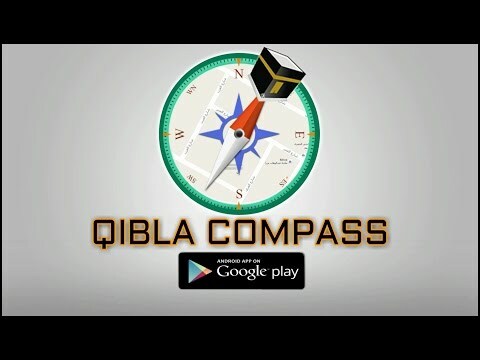 Qibla Compass Pro is a 3 in 1 app with Islamic Compass, Islamic prayers time and Hijri Calendar and date converter with holy Mecca Background. You can use this app at any place in the world to find qibla direction accurately. As Ramadan 2019 is going to start from 5-6 May,Qibla app will help you to check Salat timing and find qibla direction. • Qibla Finder anywhere on map. • Shows mecca distance from your place and location address. The Qibla is the direction that Muslim should face when doing prays during salat or namaz. It is fixed as the direction of the Kaaba in Mecca. • 15 Qibla Compass Themes. • Alarm and Notification setting for every prayer time. • Daylight saving for each prayer. • Multiple languages to chose. • Get Islamic Calendar 2018. • Convert Muslim Calendar date to Gregorian date and vise versa. • Hijri Calendar date in Arabic language. • Ramadan 2019 Sehri, Iftar and Imsac Times. • Complete Ramzan times month schedule. - Complete Online Al Quran Surahs with downloading options for each Ayat or whole Koran. • Keep tapping on + button and it will start to count, “-” will make count reverse. • Add multiple counter by adding name and count limit. - As Prayer Direction and Prayer times vary from different part of the world. Make sure first by selecting different Namaz time calculation methods in the setting screen. - Find Qibla direction by using device on a flat surface to get accurate result. Make sure there is not any electromagnetic field and metal objects close to device. If you like our App efforts, Please give your support by Giving Ratings & Reviews. Jazzak Allah Khair. - Added newly Floating Qibla Compass Option. Added newly Floating Qibla Compass Option. If you like our app efforts, Please give your support by Giving Ratings & Reviews. Jazzak Allah Khair. Ramadan Kareem. - Added Holy Al Quran Mp3 Recitations and Translations. - Now Customize Prayer Times manually. - Updated for Ramadan 2018 Times. If you like our app efforts, Please give your support by Giving 5* Ratings. Jazzak Allah Khair. Ramadan Kareem. - Fixed 99 Names of Allah issues. - Updated for Ramadan 2018. Version 4.3:- Fixed 99 Names of Allah issues.If you like our app efforts, Please give your support by Giving 5* Ratings. Jazzak Allah Khair. Ramadan Kareem. Version 4.2:- Fixed 99 Names of Allah issues.If you like our app efforts, Please give your support by Giving 5* Ratings. Jazzak Allah Khair. Ramadan Kareem. Version 4.1:- Fixed 99 Names of Allah issues.If you like our app efforts, Please give your support by Giving 5* Ratings. Jazzak Allah Khair. Ramadan Kareem. Version 4.0:- Fixed Minor issues.If you like our app efforts, Please give your support by Giving 5* Ratings. Jazzak Allah Khair. Ramadan Kareem. Version 3.9:- Fixed Minor issues.If you like our app efforts, Please give your support by Giving 5* Ratings. Jazzak Allah Khair. Ramadan Kareem. Version 3.8:- Fixed Minor issues.If you like our app efforts, Please give your support by Giving 5* Ratings. Jazzak Allah Khair. Ramadan Kareem. Version 3.7:- Fixed Minor issues.If you like our app efforts, Please give your support by Giving 5* Ratings. Jazzak Allah Khair. Ramadan Kareem. Version 3.3:- Fixed Azan Bugs.- 99 Names of Allah.- 6 Kalma Of Islam.- Tasbeeh CounterIf you like our app efforts, Please give your support by Giving 5* Ratings. Jazzak Allah Khair. Ramadan Kareem. Version 3.1:- Fixed Azan Bugs.- 99 Names of Allah.- 6 Kalma Of Islam.- Tasbeeh CounterIf you like our app efforts, Please give your support by Giving 5* Ratings. Jazzak Allah Khair. Ramadan Kareem. Version 3.0:- Fixed Azan Bugs.- 99 Names of Allah.- 6 Kalma Of Islam.- Tasbeeh CounterIf you like our app efforts, Please give your support by Giving 5* Ratings. Jazzak Allah Khair. Ramadan Kareem. Version 2.9:- Fixed Azan Bugs.- 99 Names of Allah.- 6 Kalma Of Islam.- Tasbeeh CounterIf you like our app efforts, Please give your support by Giving 5* Ratings. Jazzak Allah Khair. Ramadan Kareem. Version 2.7:- Fixed Azan Bugs.- 99 Names of Allah.- 6 Kalma Of Islam.- Tasbeeh CounterIf you like our app efforts, Please give your support by Giving 5* Ratings. Jazzak Allah Khair. Ramadan Kareem. Version 2.6:- Fixed Azan Bugs.- 99 Names of Allah.- 6 Kalma Of Islam.- Tasbeeh CounterI f you like our app efforts, Please give your support by Giving 5* Ratings. Jazzak Allah Khair. Ramadan Kareem.